1. In custody disputes, the paramount criterion is the welfare and well-being of the child. 2. General rule: custody of a child below seven years of age belongs to the mother. 3. Exception: if there are compelling reasons, custody may be denied and granted to another party under Article 214 of the Family Code. - the ability to give them a healthy environment as well as physical and financial support taking into consideration the respective resources and social and moral situations of the parents. How do our courts determine which parent has the right of custody of the children? Nothing can be more traumatic than a husband and a wife’s battle for custody of their children, except probably for a child to know that his or her parents are in a bitter, legal tug-of-war for his or her custody. 2. the ability to give them a healthy environment as well as physical and financial support taking into consideration the respective resources and social and moral situations of the parents. Posted below are excerpts of the Bondagjy decision (emphasis by boldfacing supplied). The PD 1083 mentioned in the decision refers to the Code of Muslim Personal Laws. 1. Is a wife, a Christian who converted to Islam before her marriage to a Muslim and converted back to Catholicism upon their separation, still bound by the moral laws of Islam in the determination of her fitness to be the custodian of her children? The standard in the determination of sufficiency of proof, however, is not restricted to Muslim laws. The Family Code shall be taken into consideration in deciding whether a non-Muslim woman is incompetent. What determines her capacity is the standard laid down by the Family Code now that she is not a Muslim. Indeed, what determines the fitness of any parent is the ability to see to the physical, educational, social and moral welfare of the children, and the ability to give them a healthy environment as well as physical and financial support taking into consideration the respective resources and social and moral situations of the parents. The record shows that petitioner is equally financially capable of providing for all the needs of her children. The children went to school at De La Salle Zobel School, Muntinlupa City with their tuition paid by petitioner according to the school’s certification. 2. The welfare of the minors is the controlling consideration on the issue. In ascertaining the welfare and best interest of the children, courts are mandated by the Family Code to take into account all relevant considerations. 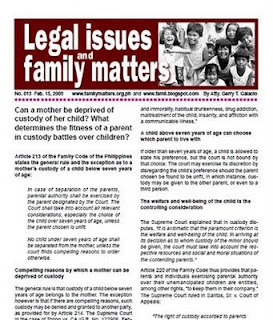 Article 211 of the Family Code provides that the father and mother jointly exercise parental authority over the persons of their common children. Similarly, P.D. No. 1083 is clear that where the parents are not divorced or legally separated, the father and mother must jointly exercise just and reasonable parental authority and fulfill their responsibility over their legitimate children. Either parent may lose parental authority over the child only for a valid reason. In cases where both parties cannot have custody because of their voluntary separation, we take into consideration the circumstances that would lead us to believe which parent can better take care of the children. Although we see the need for the children to have both a mother and a father, we believe that petitioner has more capacity and time to see to the children’s needs. Respondent is a businessman whose work requires that he go abroad or be in different places most of the time. Under P.D. No. 603, the custody of the minor children, absent a compelling reason to the contrary, is given to the mother. “Parents have the natural right, as well as the moral and legal duty, to care for their children, see to their upbringing and safeguard their best interest and welfare. This authority and responsibility may not be unduly denied the parents; neither may it be renounced by them. Even when the parents are estranged and their affection for each other is lost, the attachment and feeling for their offsprings invariably remain unchanged. Neither the law nor the courts allow this affinity to suffer absent, of course, any real, grave and imminent threat to the well-being of the child.